In 2010 HHA received a photo album as a donation from a Massachusetts couple, Barbara & John Felegian. They had found the album after the death of a great aunt, while closing up her home. Inside the album was a note written by George E. Allen and dated 1940. The not thanked the great aunt, Susan Greene, for coming Hopkinton and caring for George’s brother, Fred, until he was well enough to return to his own home. Apparently, Ms. Greene had enjoyed her stay in our village and George wanted her to have the album as a remembrance. Because Mr. Allen had mentioned Hopkinton, RI in his note, Mrs. Felegian called our Town Hall and asked if anyone in town would like to have the old album. Thus it came into our possession. The album contained pictures of the General George Thurston Mansion in Hopkinton City. There were two exterior photos of the house, as well as interior pictures of nearly every room. The photos had been taken in 1913 when George and Fred’s parents, Edwin R. Allen and his wife Mary lived there. 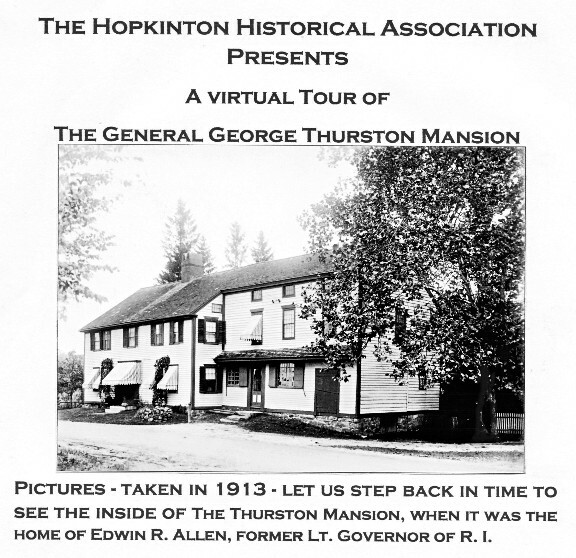 In May of 2011, using the album and other sources, the Hopkinton Historical Association presented a virtual tour of the General Thurston Mansion & Store. 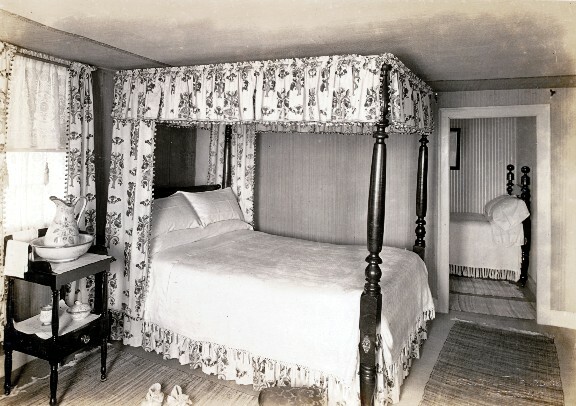 Among the sources used was an unpublished history of the home written by Mary Allen in 1916. This tour is an internet version of that presentation. Over the years the Thurston Mansion was home to a Revolutionary War Officer and three Lieutenant Governors of Rhode Island. It was also home to Hopkinton’s Town Clerk for 50 years and thus, was the Town Clerk’s Office. It was where the town’s records were kept. It was where you registered your dog and where you registered to vote. 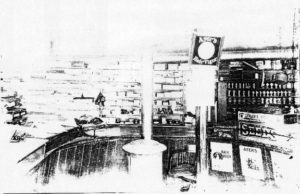 The attached general store was one of the earliest and largest general stores in the South County. 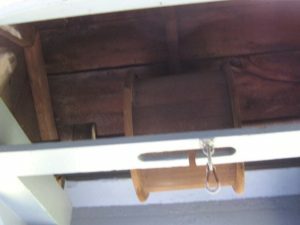 It was in continuous in operation for 158 years and throughout that time it was heart of the village life in Hopkinton City. Three ledger books from the store are part of HHA’s archives; two from its early years, between 1773 & 1775. The third is from the 19-teens to late 1920’s, the years just before the store closed with E.R. 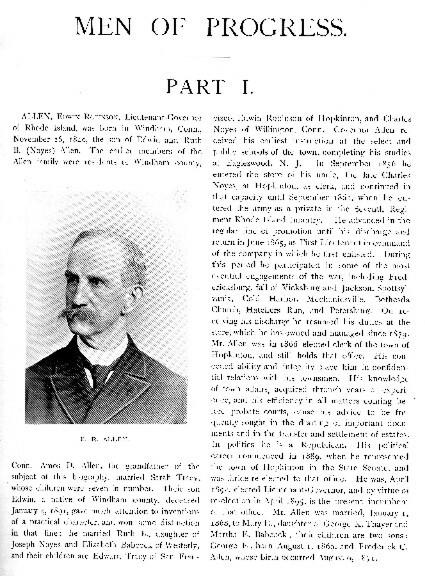 Allen’s death. Many others are in the archives of the RI Historical Society. 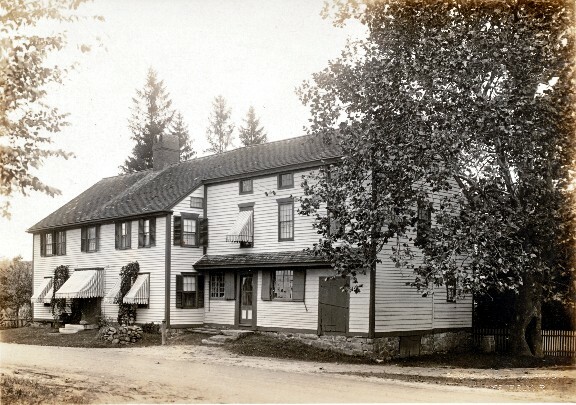 This 1969 picture of the “Mansion” was taken after the removal of the store addition; thus building appears much as it does now and also as did when it was built in 1769 by James Braman. 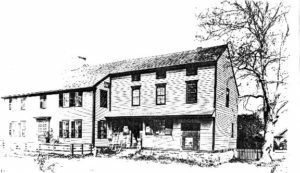 The Allens wrote, “This was a square double house, two stories front and rear, large and roomy, built of heavy oak timbers, the rafters large and the sides covered with oak clapboards, smoothed with a shaving knife and attached by hand wrought nails of large size”. They added that the house was comprised of twelve rooms, including the garret or attic, which they indicated was a room much used in early days. 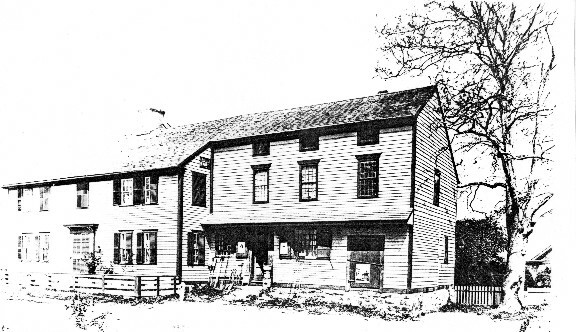 George Thurston purchased the house in 1773 and built an addition that doubled its size, in which he operated a general store, the largest of its kind in the area. This store was in continuous operation from 1773 to 1931. 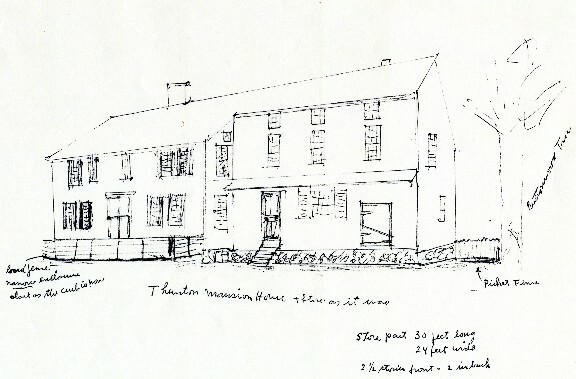 The late Gladys Palmer, local historian, made this drawing of the building, as it appeared after the store addition was completed. She also transcribed the Allens’ unpublished descriptions of it with permission of their descendants. When the colonies declared independence in 1776, George Thurston was named Captain of the 2nd Regiment of Hopkinton’s militia and saw action in the Sullivan Expedition in Newport, RI. By 1791 he was named Brigadier General of the Washington County Militia. General Thurston was born in 1741 and died in 1827 at 86 years of age; outliving two wives and several of his eight children. 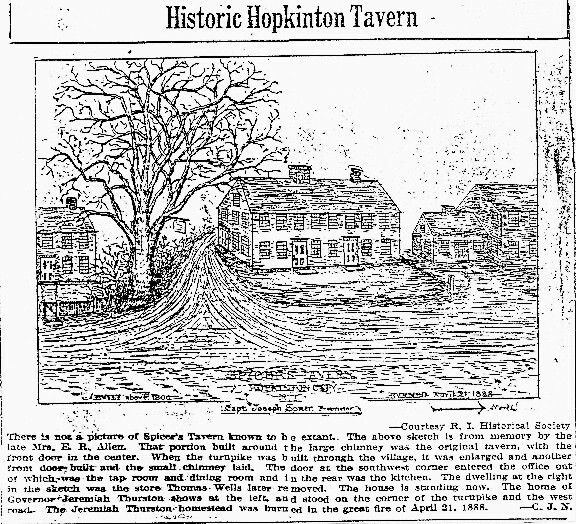 Most of his children settled in the village of Hopkinton city. Two daughters and a son died young. Two of his sons, Jeremiah and George Jr., built their homes near the Mansion and managed the store it as their father aged. 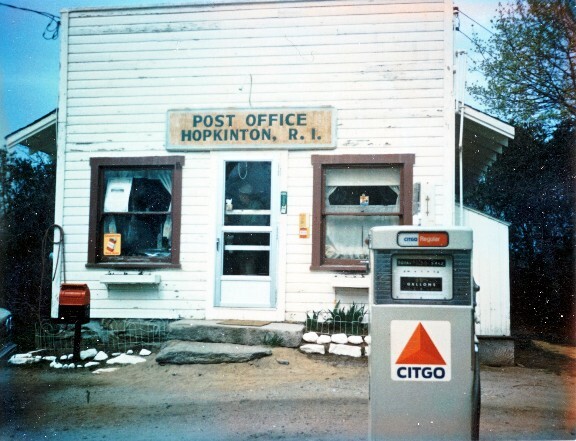 Jeremiah was appointed as Hopkinton’s first Post Master in 1811 and operated the Post Office in the store. Jeremiah went on to become RI Lt. Governor in 1816 & 1817 and his son Benjamin became the second Thurston to be elected RI Lieutenant Governor served in 1837 & 1838. Benjamin also managed the store for many years as well as representing RI in Washington DC, as a Congressman from 1847 to 1857. Before going off to Washington, he formed a partnership with his cousin, Charles Noyes. 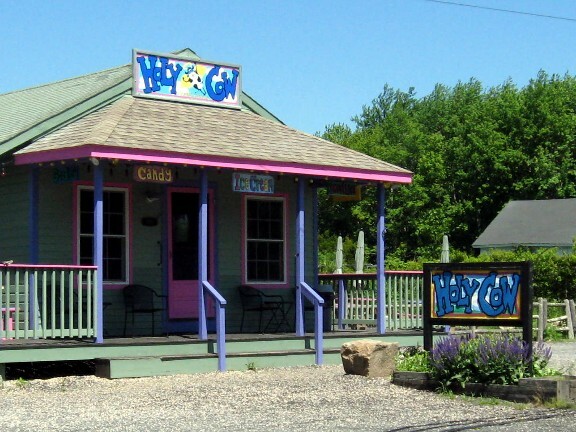 While Noyes managed the store, Benjamin slowly withdrew from it. 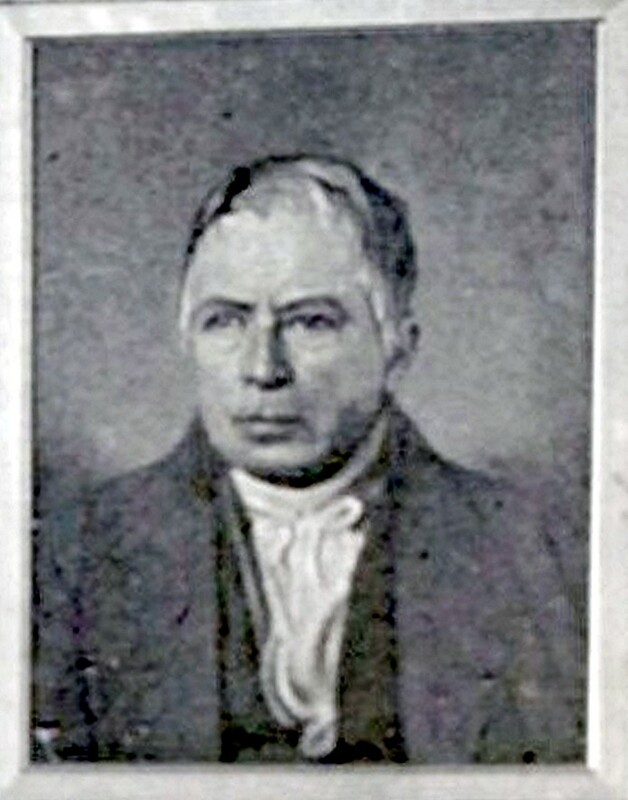 He retired from the management of the store in 1851. Mr. Noyes had moved into the mansion, sharing it with Susan and Ann Thurston, the elderly unmarred daughters of George and Dolly. After their passing he became owner of the Mansion and Store. Mr. Noyes held the rank of Major in the local militia and was single with no children. When he needed help with the store he hired his sister’s 16 year old son, Edwin R. Allen. 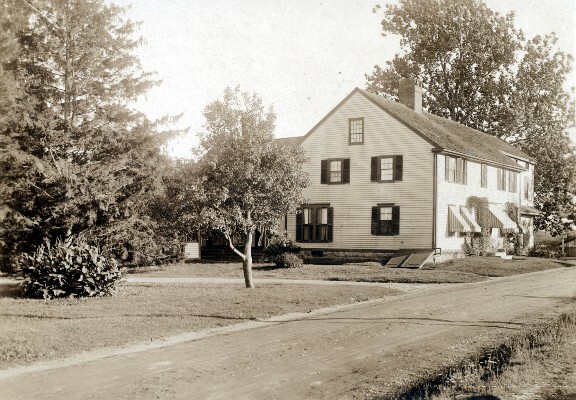 In 1856 young Mr. Allen moved from Windham CT, to live at the General Thurston Mansion and become a clerk in the store. Most of the pictures we will be seeing were taken when the Edwin R. and his wife Mary lived in the Mansion. Therefore, it is important to learn a little time speaking about the Allens and their family. This picture of Edwin Robinson Allen is from the book “Men of Progress” published in 1896, while he was Lt. Governor. At age 22, “Ned” Allen, as he was called, enlisted the Union Army and participated in many of the Civil War’s fiercest battles. He returned safely and married Mary Thayer in 1867. Mary Allen was the daughter of George and Martha Thayer, who lived in the large house that Jeremiah Thurston had built in 1801. Their home was across Main St. then know as the “N.L. Turnpike”. That house is no longer standing, the reasons for which will be discussed later. 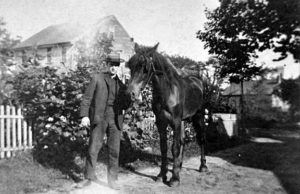 Mr. Allen became the Town Clerk for Hopkinton in the same year he married and held that position for 50 years (until 1917). Much of his work as Town Clerk was carried out in a small office in the store addition. The Allen’s sons, George and Fred, were born in the Mansion in 1869 and 1871 respectively. In 1879, after Major Noyes passed away, “Ned” Allen became the owner of the Mansion & Store. In 1889 he was elected to represent Hopkinton in the state legislature and in 1894 he began his first of two terms as the Lt. Governor of RI. 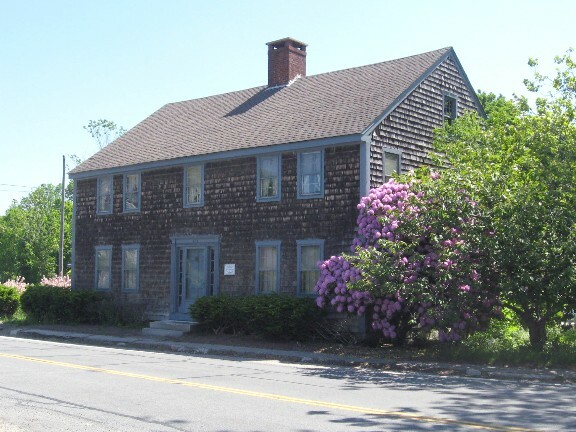 Thus, he became the third Thurston descendant coming from this old house in Hopkinton City to hold that office. Mary Allen Passed away in 1930. “Ned” followed her a year later and the store closed forever. When the store was added, the windows on the right side of the house and the attic window were completely covered. The Allens’ writing explains the strange little window installed above the window “South Great Chamber” on second story. They wrote “On the south end of the kitchen was a dark narrow stairway to the rooms above. 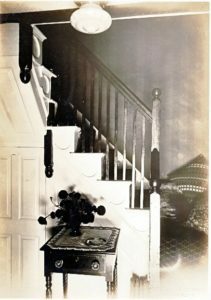 At the head of this stairway was a long narrow entry, lighted by one small high window, and from this entry ascended another short flight of stairs to the garret and another good sized room at the north end of the same for the slaves”. Also note the massive tree at the corner of the store. 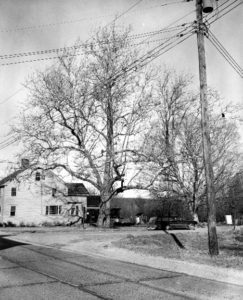 The Allens wrote “At the south end of the house stands a Buttonwood of one hundred fifty years or more. Its height is lofty, its branches far reaching. In its trunk, near the ground is a large cavity, this however, has not apparently greatly injured the tree. “The Old Buttonwood” is valued highly by its owners”. Planted before the revolution, this old tree has survived the rigors of time. It even survived State’s widening of Woodville Road in 1969 and is still highly valued by its current owners, George and Terry Browne. When I was a growing up and played hide & seek with the other kids in the village, the hole was still large enough to offer a hiding place. Today, the trunk has healed itself to the extent that only a very small child could use it to hide. The New London Turnpike is still unpaved. The Victorian porch at the north side of the house & well house in front of it. We will get a closer look at this little building later. the strange U shaped bend in the down spout at the corner of the house. This directed rain water to a cistern in the cellar that stored water to be used for household purposes. If we could see the front door in this picture it would look very Victorian, a vertically double door and each side had its own arched, frosted window. In front of the door were shutters to limit sunlight and street noise. The Allen’s writing tells us that the original door was made of oak, and had a large knocker, handle and latch all made of highly polished brass. The Allens also may offer an explanation why they found it necessary to install the awnings seen in the picture. 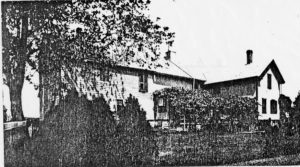 They wrote, “The four trees that formerly stood in front of the house and a large Buttonwood tree nearly opposite were consumed in the big fire of 1888, the loss of which detracted much from the appearance of the Thurston House and the comfort of its occupants”. 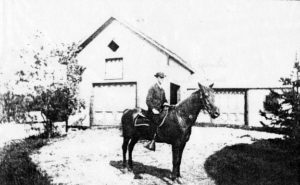 On April 21, 1888 a fire started in the Wells Carriage Factory on Clark’s Falls Road (where two house trailers now stand). Many homes were threatened, including the Thurston Mansion. 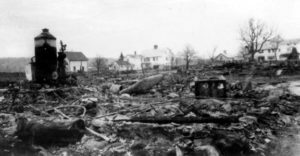 The Allens and several other families took all they could out of their homes, but fortunately only the factory and two dwellings were lost. 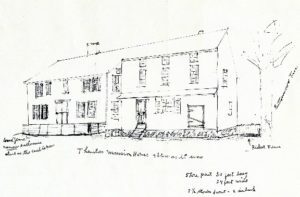 Mary Allen drew the following drawing from memory and it offers the view from the doorway of her home as she recalled it after the fire. It is said to be the only existing image of these buildings. Slide #8: Mary Allen’s Drawing Of The Buildings Lost In 1888. On the left is the house Jeremiah Thurston built in 1801 and was owned by Mary Allen’s parent’s at the time of the fire. After its loss they built the “Thayer House” that is now is home to Hopkinton’s Post Office. Not in view, but to the left of the house is Clarks Fall Road and further left is the George Thurston, Jr. house located at 1 Clarks Falls Road. 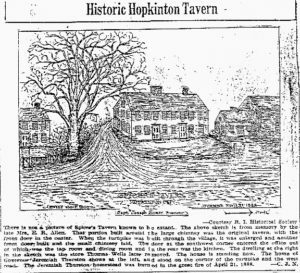 To the right of right of Jeremiah’s house is a large Buttonwood tree with a sign to let travelers know that they are welcome at the Spicer Tavern in the center of the drawing. The drive between the tree and the tavern is not Clarks Falls Road as I first thought. In the tavern’s hay-day between 10 & 12 stage coaches pulled in each day, allowing passengers a rest stop and bite to eat, while fresh horse were hitched to the stage. This was a well travel driveway! 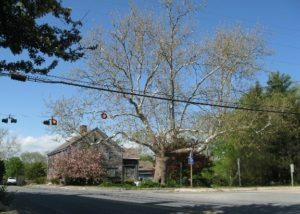 “The Thomas Wells House” is to the right of The Spicer Tavern, but the one story addition that once held a small store and Post Office is no longer there. The home is located at 495 Main St.
As we will soon see in a later pictures, the Allen’s Victorian front door was quite different from the original they described; however, the hall way behind it had changed little. They wrote that the front entry was small and nearly square. Doors on either side led into the north and south “Great Rooms”. The stair way was blocked by the home’s huge center chimney so stairs had to take two turns before reaching the narrow hall way above. 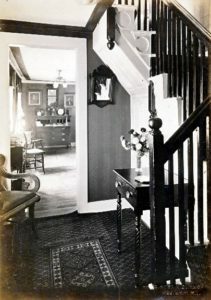 The stairs were made of oak, but the balustrade and handmade paneling on the stairway were made of pine and there was a small closet under the stairs. Today all of this looks much the same, but paint has been stripped to expose the bare pine. Perhaps the table we see was the cherry table mentioned in the inventory taken after General Thurston’s death in 1827. It also lists jars stored under the stairs. Before we step further into home’s interior, I would like to read what the Allens wrote about the appearance and use of its “Great Rooms” on either side of the entry. 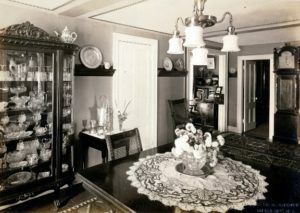 “In both of these rooms were corner cupboards, which were filled with choice china, glasses, decanters, silver and pewter. 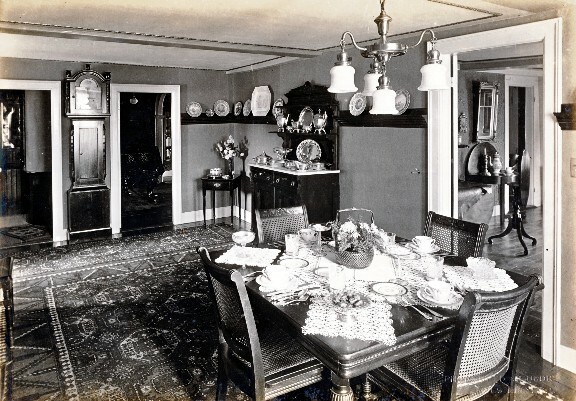 Also there was ancient crockery of pink, blue and pencil ware, a few pieces of which are now in this home of the writer.” We will see some of these as we tour the dining room. The 1827 inventory taken upon General Thurston’s indicates that the “North Great Room” that we are about to enter, was probably used as the Mansion’s dining room during his time. 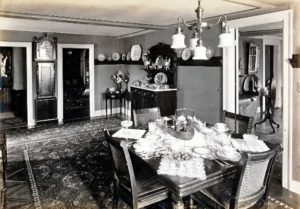 It contained –among other things – a dining table, a dozen fancy gilt chairs, a Scotch carpet, 4 dozen Liverpool plates, a coffee pot, and 16 coffee plates. 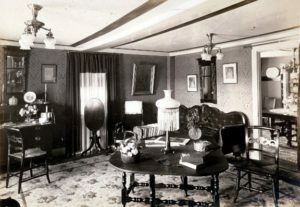 In 1913 the room was decorated as a Victorian parlor but also served as an excellent space to display some of the home’s earlier furnishing. Here In the northwest corner of the room we see a fine Butler’s Desk from the early 19th century. I believe the portraits above the desk are of General George Thurston and his first wife, Dolly. Notice – the day-cap worn by Mrs. Thurston. We will see it again, carefully preserved, in the “South Great Chamber” upstairs. The desk now belongs to Douglas and Sandra Steacy of Delaware. Mrs. Steacy is a granddaughter of George Allen, the last of the Allen family to live in the Thurston Mansion. When the desk was sent out for repair and refinishing recently the Steacys found two sets of Hopkinton voting lists from over 100 year ago. The voting lists had been used as drawer liners in the desk. The Steacys have generously donated them to the Hopkinton Historic Association. The southwest corner: Through the doorway we see the Victorian front door with its arched frosted glass that to replaced the original colonial door. This and the next picture were taken from nearly the same point of view. 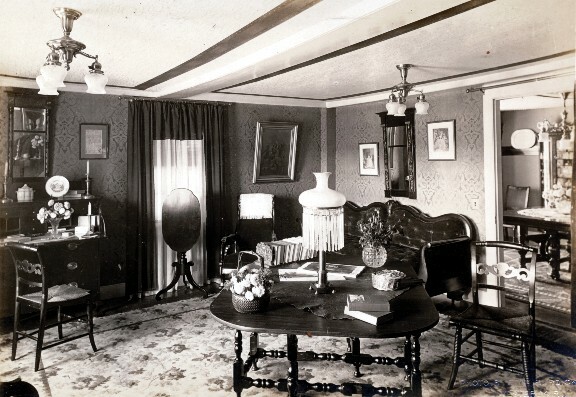 By taking more than one picture of a room the photographer could use light to advantage and also showcase as much of the Allens’ fine furnishings as possible. 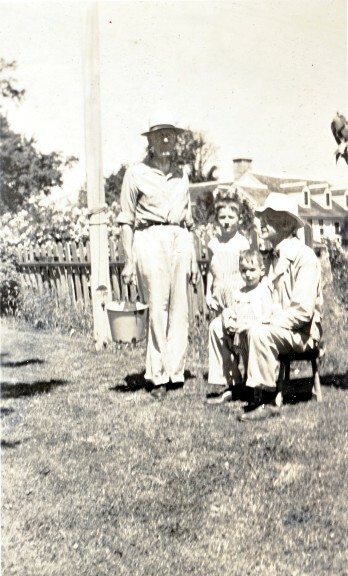 Charles Noyes Burdick, a grand nephew of the former owner, Major Charles Noyes, visited the home in 1933 and wrote “Mrs. 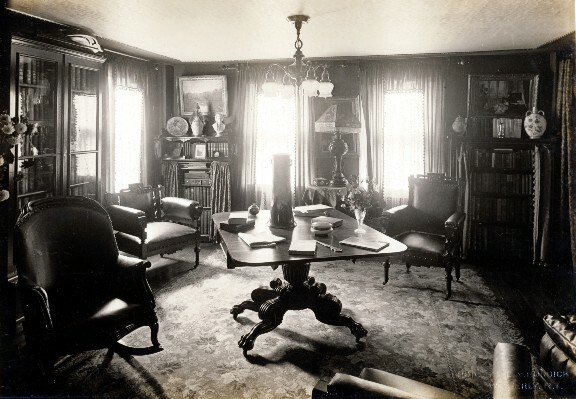 Allen, had a taste for antique furniture, and hers was one of the finest collections in Rhode Island, many pieces of which are connected with the house and have come down to her and her husband from former occupants of the place”. I’m sure Mary Allen took an active part in staging these pictures to showcase her collection. Can you note any differences from the first picture? Carpet, table, picture, chairs, items on tables, better view of fire place, etc. At the right of this picture is a view through a doorway into the Allen’s dining room, the next room on our tour. Again, some items have been relocated since the previous pictures. Notice: that the portrait of General Thurston over the desk has been replaced by what looks like an antique sampler, perhaps made by one of his daughters. 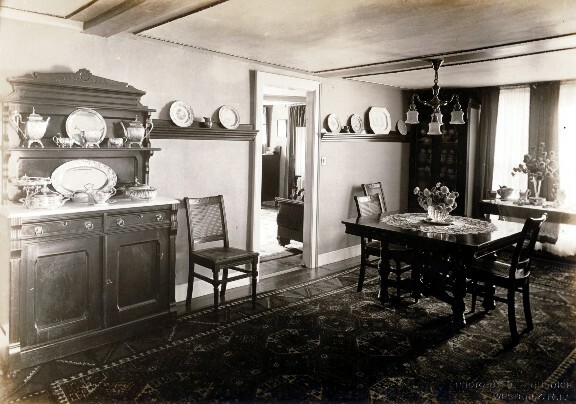 We should note here that the Allen’s dining room was the original kitchen back when the house was built in 1769. 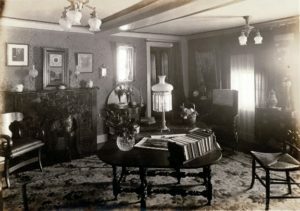 At the left is a large ornate china cabinet. Hope Greene Andrews bought this at the auction after George Allen’s death and it is now in her granddaughter’s home. The closed door leads to the kitchen in the ell. There are no 1913 pictures of this room or any of the more utilitarian rooms in the house. 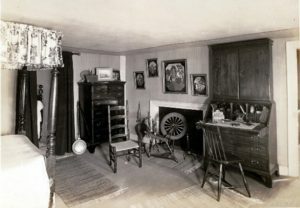 The open space set back in the wall beyond the kitchen door was used as a den with a desk and candlestick telephone. Notice: the picture of Edwin R. Allen on the phone’s bell box is the one we saw earlier. 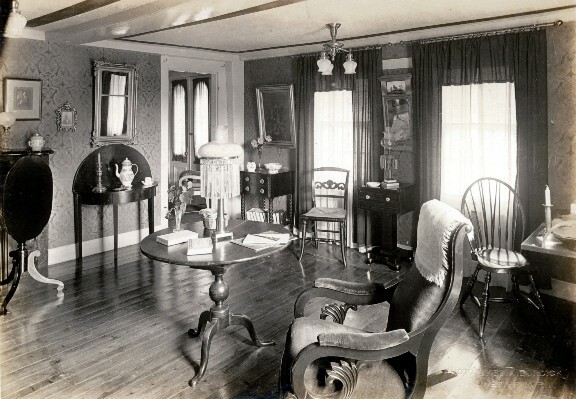 The door to the left of the grandfather clock led to a small sitting room in the Allen’s time. It was in a small addition that had been added to the east of the house sometime after the store was added, blocking the south windows on the east side of the original house. 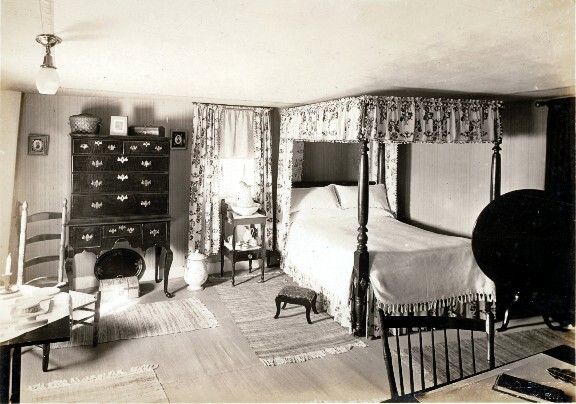 The Allen’s tells us that in earlier times this room was called the “summer bedroom” and was a pleasant room that had a window to the east and one to the south. 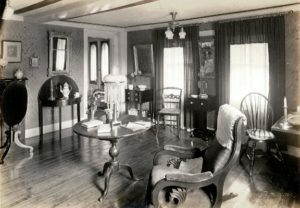 The space behind the door to the right of the clock had been incorporated into the “South Great Room” during the Allen’s time and we will see that space to better advantage when we tour that room. In earlier times it was called the “winter bedroom”, because as the Allens explain it was warmer than the other, being enclosed on all its four sides. She wrote that all the light and air for the “winter bedroom” came through a door leading into it from “summer bedroom”. Must have been stuffy! As mentioned earlier, a back stairway in this area led up to the slaves’ quarters when this room was the General’s large colonial kitchen. The stairway enabled the servants to go about their chores, tending fires, fixing meals, etc, without being much noticed by their masters. The great kitchen fire place was of no purpose in Victorian times and was covered over. Here it’s hidden in the behind wall to the left of the hutch. It would be just underneath the large rectangular platter that is displayed on the wall. The north wall: Before the Victorian remodeling there was another small bedroom in this corner and there is a mystery associated with it. The mystery involves a weary stranger, his disappearance and the possibility of buried treasure. As the story is told, a traveler came to the door asking to stay overnight. He said he was over taken by dark and was very tired. 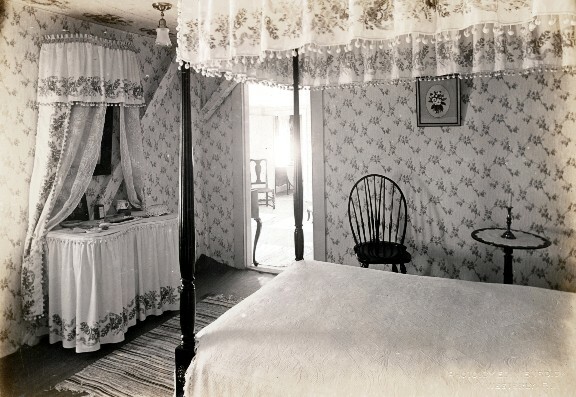 Being kind and hospitable General Thurston allowed him to stay in this little room. In the morning, however, the widow was open and the man was gone leaving only a mystery. Some years passed and another man came to the door and offered some explanation. He told the family that he had met the mystery man, who had confessed a crime to him. He had stolen money & valuables and was being followed by the authorities. He came to the Thurstons to evade them and to hide his booty so he would not be caught red handed. He left in the night, but buried his loot on their property before leaving the area. He had never gotten back to retrieve his prize, but had given the second man an idea where it was hidden before he died. The man and many since have looked for the treasure in vain. The elderly daughters of General Thurston, Susan and Ann, and Barbary Sampson, their African American servant, were in the home when both of these men came to the door and passed the story along. One of the people who heard their story was Miss Sally Larkin, a servant girl in the home helping Barbary with household chores and with the care of the elderly sisters. She and others who had heard the story passed it on after the Thurston sisters and Barbary had passed away. They recalled the excitement that the tale generated in the village. The Allens heard the story from my great, great grandmother, Sally (Larkin) Kenyon and other villagers who had heard it from those who lived in the home at the time. 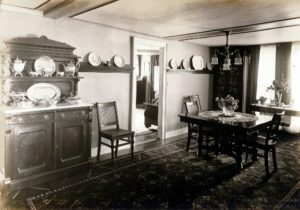 We have no pictures of the Allen’s kitchen in the ell, as it wasn’t considered a fashionable part of the house. However, I have some memories of it from childhood visits with their oldest son, George. I recall an area at the east end of the ell with a sink under the window and cupboards and cabinets on either side. 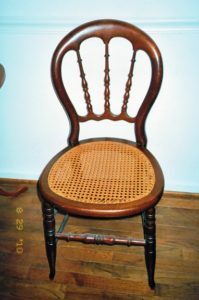 These were of darkly stained bead-board and the hardware was bronze colored. There also was a black cook stove, and a small eating area in the kitchen, where on a couple of occasions George Allen served me soft-boiled eggs on toast, a breakfast I love to this day. 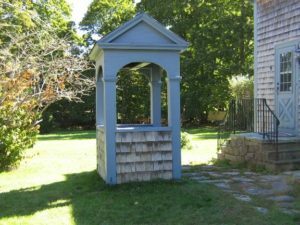 The exterior kitchen door led to a large porch at the north side of the house and stepping off the porch one would be standing on a wide stone walk in front of the well house. Looking east at the well house at the home’s north side. I always admired the mechanics of this little building. The rope for the water bucket was attached to the large pulley. A rock with a ring in it, serving as a counter weight, hung on a wide belt from the smaller pulley. Pulling the rope to let the pail down for water lifted the counter weight. The effort to do so allowed the pail to be lowered slowly. In turn, it also made it a great deal easier to pull up the full pail of water. Once up the pail could be spilled into a spout inside the well house and this would fill up an empty pail hung on spout at the outside of the well house. George and Fred Allen with me and my brother Phillip. A paved parking lot now covers this area. 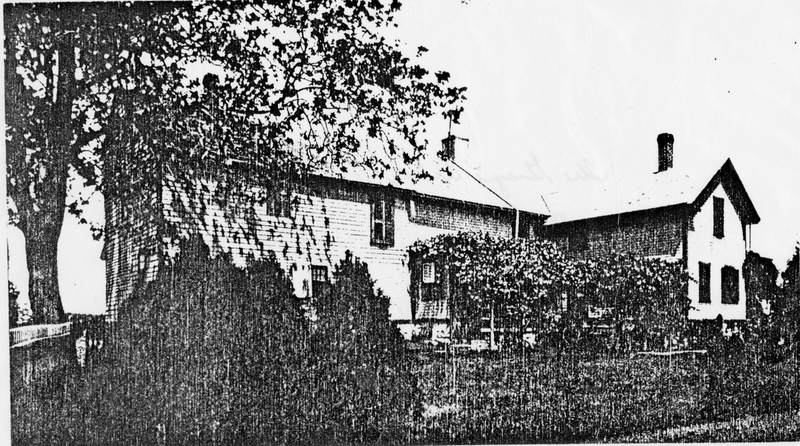 The Deake-Utter House, now owned by Thurm and Doris Silks can be seen in the background. The George Allens’ garden was behind the picket fence, closer to the house than the Silks’ garden is now. The barn was built before 1888, as it can be seen in a picture taken from across the road just after the Great 1888 Fire. The detailing on the doors fits the time period. I have great memories of both of the outside and the inside of this building. There was a cellar underneath the barn that was open to east. 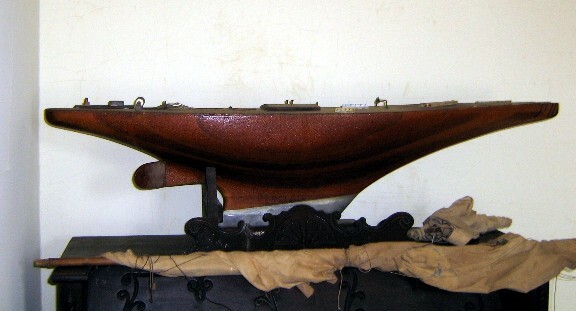 It housed a small row boat that the young Allen brothers’ used sail model boats they made in local ponds. There was scuttle hole in the floor above barn’s cellar through which horse manure could be shoved. After Mr. Allen moved into a nursing home, we kids discovered this trapdoor and explored the barn itself. George and Fred’s 1920’s cars were still there as were the model boats they built and sailed. The Steacys have donated one of these boats to the HHA. 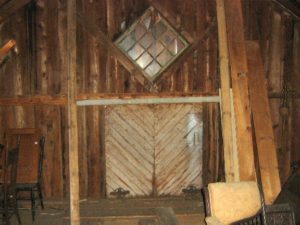 The picture of the barn’s exterior reminded me that the diamond shaped window is no longer visible and I wondered if had been removed when the barn was remodeled in the 1970’s. With permission of the present owners, George and Terry Brown, a trip inside proved it was still there, hidden under the outer sheathing. Holding the horse is my great uncle, Frank Mills. Behind him is the house on Woodville Road in which I grew up. It was demolished in 1969, when the road was widened. The belfry in the background identifies it the former First Baptist Church of Hopkinton & later the “Colonial Theater”. This view of the ell is what Frank Mills would have seen from his perspective. The Allens indicate that a single store ell was added at the northeast side of the house a few years after the house was built. The ell served as a “Summer Kitchen” and had large stone chimney and a brick oven as we saw earlier. The Allens removed the original ell in 1881 and built a new, one and a half story ell with a modern brick chimney on the old foundation. The taller ell made major changes in the main house possible. This included a back stairway to the main house making it possible to eliminate the original back stairway that had gone from the colonial kitchen to the attic. Also note the granite patio & grape arbor in the angle between the ell and the main house. I can remember many an after school grape fight, fought with ammunition from this arbor! That the shutters have been used post advertisements. 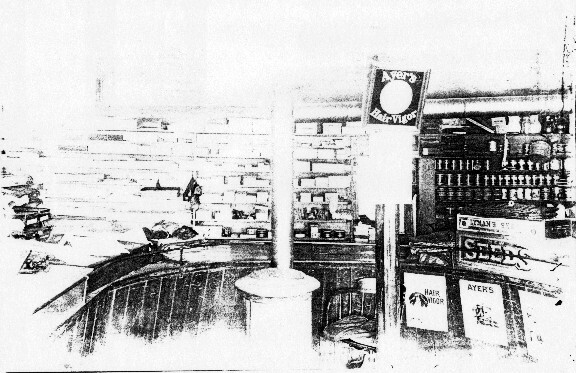 the circular counter with an iron rail of at the top that had been installed when the store was built was still in place. the coal stove which had replaced the original wood stove. However the Allens indicate that the old stove was stored above the store. 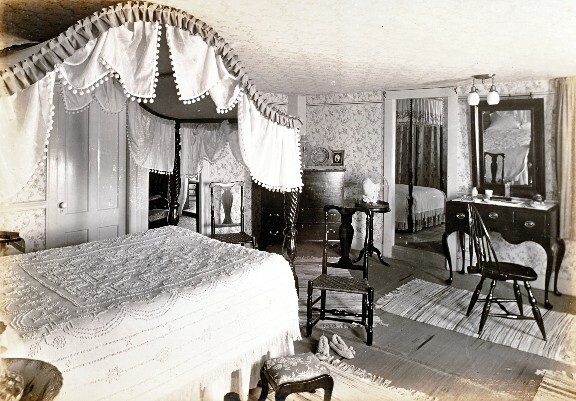 Mr. Burdick ends his pieces about the interior of the store as follows: “Those of us who have sufficient imagination can picture to some extent, the scenes of the old days, when the Thurstons, Major Noyes and Ned Allen catered to the needs of a widely scattered clientele. As for myself, as I stood in that little old store, I tried to picture my father as he looked in the old daguerreotype of him as a boy, standing behind the counter, tying up packages and listening to the “war talk” of the idlers, who were waiting for the mail coach, while the old Major, whose name I bear, sat on his high stool behind the desk casting up his accounts for the day”. A small room between the store and the main house was used by “Ned” Allen as his office during the 50 years he served as Hopkinton’s Town Clerk. 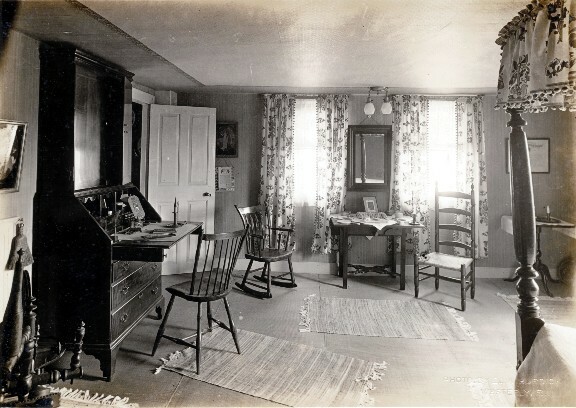 Mr. Burdick wrote that the “whole history of Hopkinton” going back to the 1700’s had been held in four safes in this room. That door led directly into the South Great Room, which was “Ned” Allen’s library full of well selected books. The two windows in front look west out onto the “Turnpike”. From the window on the left Mr. Allen could see if a customer was coming up to his store. Notice: the curtains on the bookcase between the windows can be closed to protect the books from sunlight and dust. 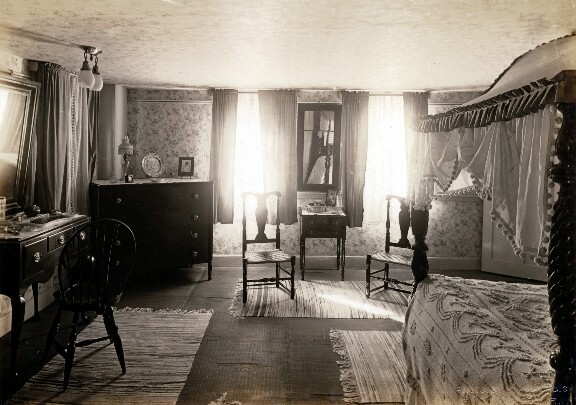 There are no windows on the right side of this part of the room because of the store addition; however, looking into the background of this photo light can be seen coming from what had been the “summer bedroom”. 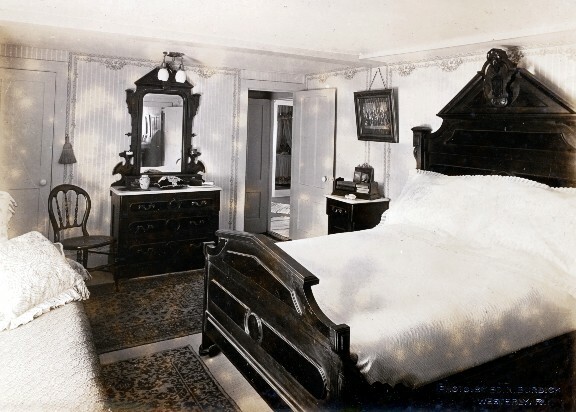 The area where the piano stands was once the part of the “winter bedroom”. The doorway between the bookshelves led back into the store. Mr. Burdick tells us that Edwin Allen’s library included over 150 volumes relating to the Civil War with official records, both from the Union and the Confederate reports. 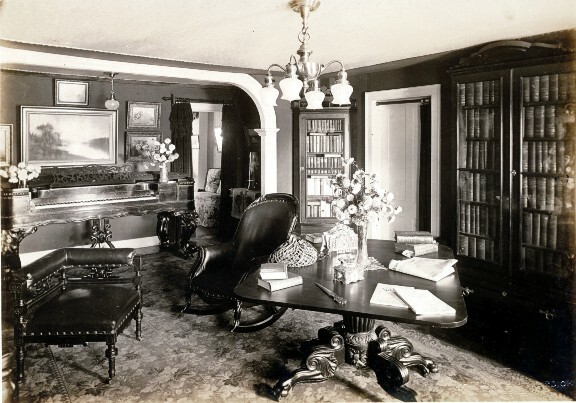 At the auction following George Allen’s death in 1958 Hope Andrews’ husband Loren bought all 150 volumes of the Civil War collection and it is now in possession of their son, Loren Jr.
Notice: the black marble Victorian fireplace on the interior wall and other fine Victorian pieces. During General Thurston’s time, this room would not have looked as refined. From reading a house inventory from 1827 it seems as if this may have been a room in which the General and his gentleman friends discussed business and the issues of the day, while his wife entertained the ladies elsewhere in the house. The most expensive piece in the room was a brass clock valued at $45. Other items included a sideboard, six green quilt chairs, three old chairs, carpets, mats and two spitting boxes. Spitting boxes which probably would not be part of the décor for mixed entertaining. Today the Victorian mantel has been removed, revealing the original granite that held the fire for General Thurston and his friends. Next to the fireplace is another bookcase and beyond it is an opening leading into entry and stair way we saw earlier. When we were here earlier we went into the North Great Room and dining room. Now let’s go upstairs to the North Great Chamber. Notice: the silver plate that seems to hold a Victorian calling card. Looking into the southwest corner of the room we can see the two west windows and door to the stairway. Notice: The many fine antiques that were part of Mary Allen’s collection. 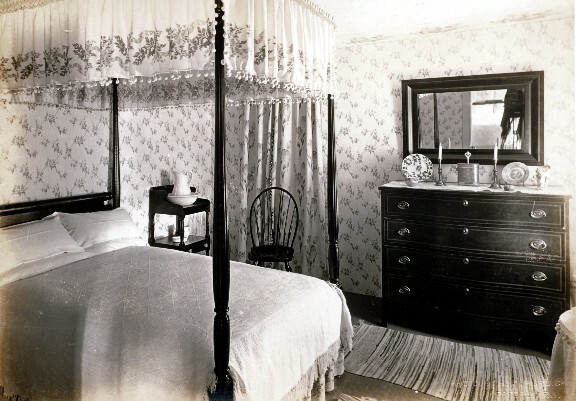 The Allens wrote “In the north great front chamber stood a high post maple bedstead.” In fact they called this the “Maple Room” because many of the antiques in it were of curly maple. This seems to be true of the desk as well as the bed. Also notice: the tall “slop jar” for waste water etc. 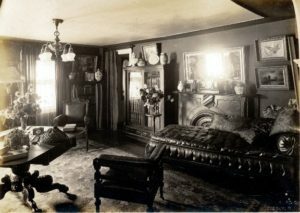 By 1913 the Allens had running water and inside plumbing so these are a display of her antiques. 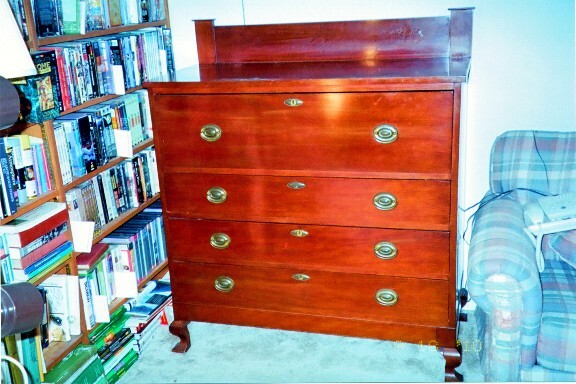 Notice: the tall “High Boy” dresser which couldn’t have been too tall due to the low ceiling. Notice: the silhouettes on either side of the dresser. At the left is General George Thurston; his oldest son, Jeremiah, is on the right. The Allens mention this “Hepplewhite” mahogany bureau had always been part of this rooms’ furnishing. Notice: the bed-warmer, the bellows and brass toped andirons by the fire. 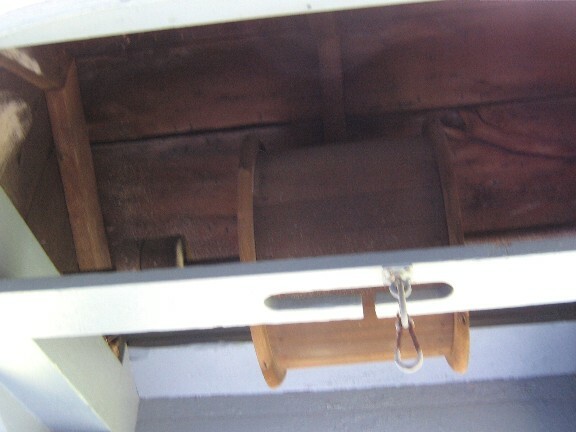 The 1827 inventory lists several “Wheels” stored in the garret or attic. Some of them were for spinning linen and some for wool. The spinning wheel pictured here may have been one of them. 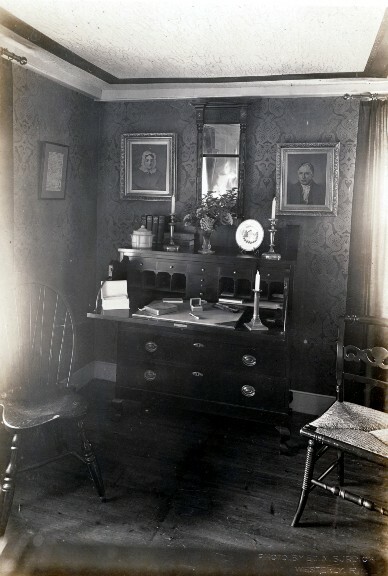 Notice: the fine colonial desk with its candle and writing implements. Here we are able to look into another much smaller bed room. 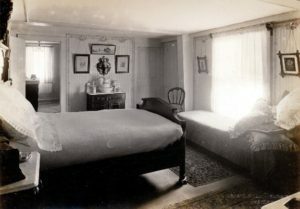 In the 1827 inventory this room in the north east corner of the second floor is referred to as the “third” bedroom, one of 3 small bedrooms upstairs. This room called the “Kitchen Chamber” was over the colonial kitchen and said have been the warmest bedroom on the second floor. Through the door at the left, we can see the “third” bedroom that we saw from the North Great Chamber. The door at the right is a small closet. The door to the right of that leads to the landing of the back stairway in the ell built in 1881. Notice: the chair by the beam in front of that door. Notice: the heavy Victorian furniture with the marble topped tables give the room masculine feel. Notice: another chair like the one belonging to the Steacys. The door leads to the attic, but was not there in the colonial configuration of the house. Then the stairway came up from the kitchen, through a stairwell behind this wall, to the dark landing leading to servant’s quarters in the garret. The doorway to the right opens to what was once that stairwell. In this photo we see a one of several doors that open into this space. In the back ground of the view through the door we can see a corner of the South Great Chamber. Beyond is a doorway to the south bedroom, a small room over the store and facing west over the “Turnpike”. We will enter this room next and notice the it has a much more feminine feel about it. The light coming in from the right is from a full window over the store that had an awning and was seen in the exterior picture of the house. Notice: the camera in the mirror; this is the only photo in which this occurs. 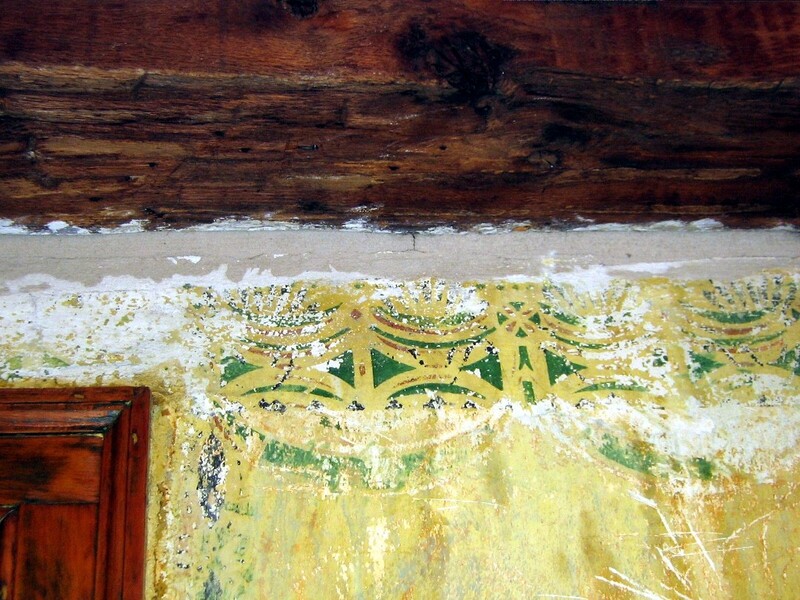 Notice: that the ceiling has been wall papered above the dresser. The door in the back ground is the entrance to Front South Chamber from the upper front hall entry. The door back into the South Bedroom is in the center of the picture. Dolly Thurston’s day-cap to the left of that door, preserved under a glass bell. Dolly’s silhouette above and to the left of her cap. the slippers at the corner of the bed. Nice touch. the two doors, one closed – one open, beyond the bed. Through the open door we can into another small room perhaps used as a dressing room. 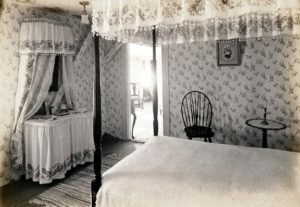 The light beyond that come from a window in another small bed room over the store called the Southeast bedroom in the 1827 inventory. That door is now permanently closed, but still exists at the back of a closet built against that wall covering it. If we could open the door it would led to that dressing area now used for storage. We can’t open that door but we can open the closet! Notice: the door’s frame inside the closet. 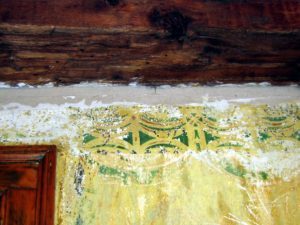 The Allens tells us that while removing wall paper in the North Great Chamber in 1876, they discovered stenciling on the plaster wall. They wrote that it was a floral design in red and green on a yellow or buff back ground. They thought other rooms may have been decorated in similar style. This picture shows that their hunch was correct! Notice: the closed door is covered by a hanging. 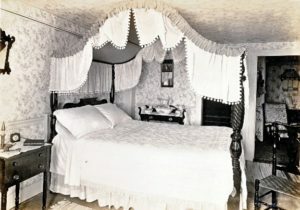 Notice: beautiful bed and the wash stand behind it. Notice: the door we see through the bed’s canopy is to second floor hall and the stairs and It’s time to head down & end our tour. With E. R. Allen’s death in 1931, the store that had been in business since 1773 closed forever. Its place at the heart of the village was taken over by this little building located nearly on the site of the old Spicer Tavern. Susan Mills had operated the Post Office from her own home at 450 Woodville Road behind the Thurston Mansion since 1924. 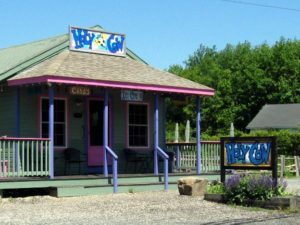 About the time the old Thurston store closed, she bought this building and set up the Post Office and a general store here. In tune with the times, she operated a filling station there as well! Appropriately this picture was taken in 1969, the same year the first picture we saw of the mansion was taken. By that time Helen Mills, Susan’s niece by marriage, had taken over the Post Office, filling station and store. It is now “Holy Cow” ice cream.